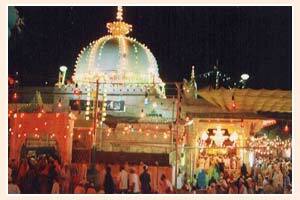 'Dargah Sharif' or 'Holy Dargah' is one of the most sacred Muslim shrines in the country. 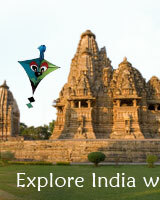 It is situated in Ajmer. It is acclaimed by both Hindus and Muslims. It is the tomb of Khwaja Moin-ud-din Chisti, a Sufi saint who came from Persia and devoted his life to the service and upliftment of the poor and downtrodden. People of all walks of life and faith from all over the world, irrespective of their caste, creed and belief; visit this great shrine to offer the flowers of their respect and devotion. 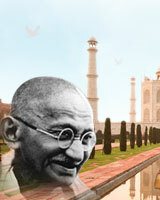 The rich and the poor stand side by side to pay homage and respect to this divine soul. The Dargah has a massive gate with silver doors. A silver railing and a marble screen surround the actual tomb of the saint and it is made up of marble with a gold plated dome.